fit-DVR (fit-CCTV) – a miniature fanless PC supporting up to 16 analog video cameras with 8 audio channels and PTZ. fit-NVR (fit-PoE) – a miniature fanless PC with 4 Power-over-Ethernet 802.3af compliant Gigabit Ethernet ports. fit-DVR and fit-NVR provide unmatched versatility by supporting either analog or IP cameras, having CPUs ranging from low-power 6.4W AMD G-Series up to high-performance Intel® Core™ i7 running either Linux or Windows 7 and incorporating full PC functionality including high-capacity storage, networking, display interfaces and I/O. Measuring just 19x16x4 cm, fit-DVR and fit-NVR are the smallest platforms in their category. The passively-cooled dust-proof aluminum enclosure and temperature range of up to -40°C – 70°C make fit-DVR and fit-NVR ideal for outdoor installation. 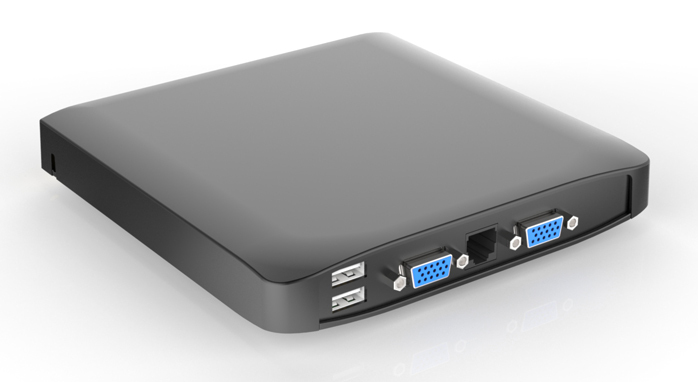 fit-NVR is a miniature fanless PC designed to support up to 4 IP video cameras with Power-over-Ethernet 802.3af. PoE simplifies surveillance system installation by powering each IP camera through the same Ethernet cable used for data transmission. fit-NVR is a fully functional PC with dual-head display, wired and wireless networking, multiple storage devices, rich I/O and support for both Linux and Windows 7. Models range from fit-NVR LP – built upon the low-power CompuLab fit-PC3 LP platform up to IPC-NVR based on CompuLab Intense PC with Intel® Core™ i7 CPU. 4 dedicated Gigabit Ethernet controllers, each driving a single PoE port provide full bandwidth independently to each hi-res IP video camera. fit-DVR is a miniature fanless PC designed to support up to 16 PAL/NTSC/SECAM video cameras with 8 audio input channels, 8 GPIO lines and RS485 port for PTZ. fit-DVR is a fully functional PC with dual-head display, wired and wireless networking, multiple storage devices, rich I/O and support for both Linux and Windows 7 with. Models range from fit-DVR LP built upon the low-power CompuLab fit-PC3 LP platform up to IPC-DVR based on CompuLab Intense PC with Intel® Core™ i7 CPU. Video capture API, Ffmpeg and ZoneMinder support are freely available. fit-NVR / fit-DVR are based on CompuLab fit-PC3 and fit-PC3i using the FM-PoE / FM-VC FACE Module respectively. IPC-NVR / IPC-DVR are based on CompuLab Intense PC using the FM-PoE / FM-VC FACE Module respectively. For demanding applications CompuLab uSVR with FM-PoE or FM-VC and 4 internal RAID / JBOD hard disks is available on special order. For detailed specifications of FM-PoE and FM-VC see FACE Modules HW specifications. fit-NVR and fit-DVR price starts at $482. IPC-NVR and IPC-DVR price starts at $553.